SUPERBUY, the Chinese products shopping agent giant, recently re-designed and launched its new home page and four new businesses. SUPERBUY, the Chinese products shopping agent giant, recently re-designed and launched its new home page, https://www.superbuy.com . 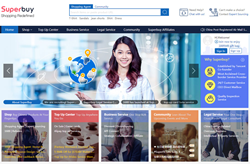 Besides their traditional business of buying Chinese items on behalf of people outside of China, there are three new businesses which are Top-up Center, Business Service, and Legal Service on the new home page and are put in the most visible place on the home page. Also, the site slogan has been changed from “Purchase Chinese Products for Global Users” to “Global Leading Cross-border Integrated Service Platform”, that might mean Superbuy starts the diversification after being dedicated to the China shopping / shipping agent service for years. The following is Superbuy’s official description of their three new businesses, Top-up Center, Business Service, and Legal Service. I’d like to, however, also explain their main business, shopping agent service, to people who intend to try buying from China because Superbuy indeed does the shopping agent business great and has gained over 1,000,000 global users. China Shopping Agent: The Taobao-leading Chinese ecommerce sites have two points, Low Prices and Various Products, that attract people living outside China, but there are two obstacles for people outside China to shop on the Chinese online shopping sites, the language and payment. Superbuy removes the two obstacles. People outside China only need to send Superbuy links to the products they want on the Chinese ecommerce sites and for a modest fee Superbuy will take care of the rest. Superbuy staff buy the items, make the payment, accept the parcels, consolidate them and then forward them. Superbuy Top-up Center: This business servers people outside China who want to play Chinese games, subscribe Chinese movie streaming sites, use Chinese third-party payment methods like AliPay and WeChat Wallet but do not have the Chinese debit cards to do the top-up. Users can easily buy the top-up service using their PayPal, MasterCard/VISA, or international credit card. Superbuy Business Service: This service provides one-stop purchase and delivery for merchants outside of China including e-commerce business, gift/bulk purchase, group purchase, and Amazon sellers so that merchants can focus on the marketing. It’s worth mentioning that currently Superbuy research team is developing a system with which users can build an online shopping site and upload product info with one click. Superbuy Legal Service: This service provides comprehensive and professional legal services to enterprises from China and overs 100 countries for their China and overseas business, including the establishment of Chinese and overseas companies, overseas companies accounting, auditing, tax arrangement, transnational intellectual property registrations, risk avoidance and dispute settlement, cross-border trade structure planning and dispute settlement, corporate legal counsel services, cross-border M&A and restruction, China or overseas listing services etc.